I fixed a deadlock in PyMongo 3 and PyPy which, rarely, could happen in PyMongo 2 as well. Diagnosing the deadlock was educational and teaches us a rule about writing __del__ methods—yet another tip about what to expect when you're expiring. The statement del c removes the variable c from the namespace. The object that c had referred to has no more references, so CPython immediately calls its __del__ method, which tries to get the lock. The lock is held, so the process deadlocks. It prints "getting lock" and hangs forever. This is fine. The __del__ method completes and releases the lock before the next statement acquires it. Just like the first example, this prints "getting lock" and deadlocks. A few weeks ago, I found a deadlock like this in my code for the upcoming PyMongo 3.0 release. From there, I discovered a far rarer deadlock in the current release as well. As you iterate the cursor, it returns documents from its client-side buffer until the buffer is empty, then it fetches another big batch of documents from the server. After it returns the final document of the final batch, it raises StopIteration. But what if your code throws an exception before then? 1 / 0  # Oops. In order to send the message to the server, PyMongo 3.0 has to do some work: it gets a lock on the internal Topology class so it can retrieve the connection pool, then it locks the pool so it can check out a socket. In PyPy, we do this work at a wholly unpredictable moment: it's whenever garbage collection is triggered. If any thread is holding either lock at this moment, the process deadlocks. Great, so a test had left a cursor open, and about 30 tests later that cursor's destructor hung waiting for a lock. It only hung in PyPy, so I guessed it had something to do with the differences between CPython's and PyPy's garbage collection systems. I was doing the dishes that night when my mind's background processing completed a diagnosis. As soon as I thought of it I knew I had the answer, and I wrote a test that proved it the next morning. PyMongo 2's concurrency design is unsophisticated and the fix was easy. I followed the code path that leads from the cursor's destructor and saw two places it could take a lock. First, if it finds that the MongoClient was recently disconnected from the server, it briefly locks it to initiate a reconnect. I updated that code path to give up immediately if the client is disconnected—better to leave the cursor open on the server for 10 minutes than to risk a deadlock. Now, the two lines of reset that run while holding the lock can't trigger a garbage collection, so the cursor destructor knows it isn't called by a GC that interrupted this section of code. And what about PyMongo 3? The new PyMongo's concurrency design is much superior, but it spends much more time holding a lock than PyMongo 2 does. It locks its internal Topology class whenever it reads or updates information about your MongoDB servers. This makes the deadlock trickier to fix. I borrowed a technique from the MongoDB Java Driver: I deferred the job of closing cursors to a background thread. Now, when an open cursor is garbage collected, it doesn't immediately tell the server. Instead, it safely adds its ID to a list. Each MongoClient has a thread that runs once a second checking the list for new cursor IDs. If there are any, the thread safely takes the locks it needs to send the message to the server—unlike the garbage collector, the cursor-cleanup thread cooperates normally with your application's threads when it needs a lock. Must not reference globals or builtins, see my "normal accidents" article. Must not access threadlocals, to avoid a refleak in Python 2.6 and older (see the bug that cost me a month). It must not take a lock. Weakref callbacks must follow these three rules, too. Don't use __del__ if you can possibly avoid it. Don't design APIs that rely on it. If you maintain a library like PyMongo that has already committed to such an API, you must follow the rules above impeccably. 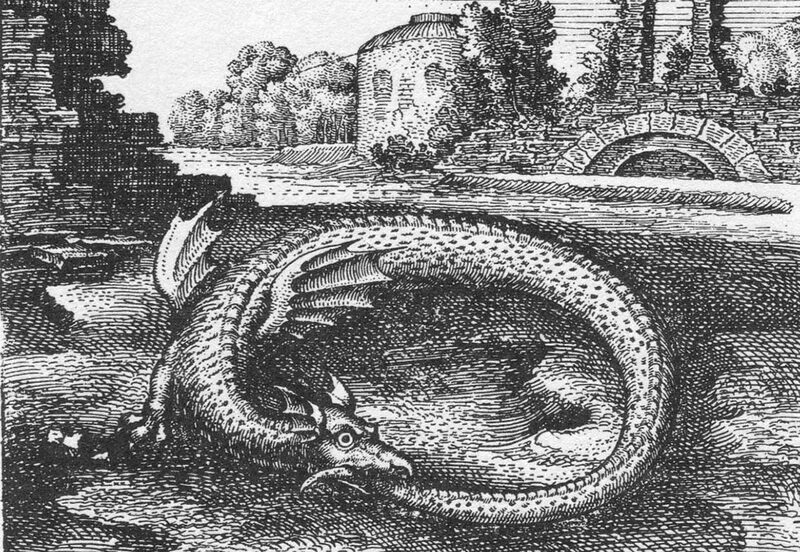 Image: Ouroboros, Michael Maier (1568–1622). ← Response to "Asynchronous Python and Databases"